How does one go about capturing the aura of a street? Is a street defined by its signs, its storefronts, or by its citizens? To a newcomer, the task of defining a street can seemingly take a million different directions. Luckily for us, our criteria for encapsulating the soul of a street was a little more confined. For our purposes, the aura of a street could be served up in a little styrofoam box for not more than 7 RMB a pop! Indeed, there is a lot to be said about the heart of a neighborhood lying in the food sold there—as my peer Tyler and I would find out on a rainy Monday morning when we set out to discover something about Zhaozhou Road that couldn’t be seen by the casual observer. The night before we set out to accomplish this mission armed only with a camera, a recorder, and a ravenous appetite, we had discussed what possible themes we would want to pursue with our lines of inquiry. After tossing around a couple of possibilities, Tyler came up with the idea of shifting our focus from the visual plane and instead paying special attention to the sounds that defined Zhaozhou Road. Sound, he claimed, completes the connotative power within a scene—but in most projects of this nature, sound is usually made secondary to sight. 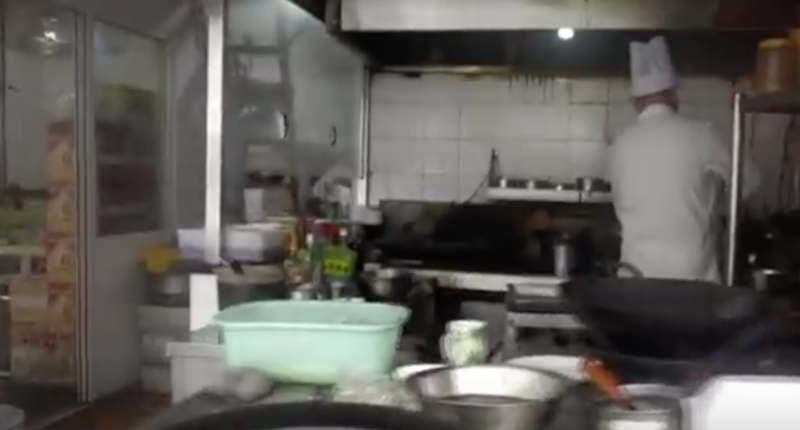 Thusly, in addition to the basic interview questions we had gathered on earlier visits to Zhaozhou Road with our partner Xiran, we decided to collect two more data points: the first one featured the sounds made when hawkers were making their food. And the second data point? Their favorite songs. So while surrounding passerby would walk past a woman selling 3.5 kuai Shandong-style pancakes near the middle of Zhaozhou Road with nothing but discordant motorcycle engines to play them through, we now hear Celine Dion belting out My Heart Will Go On from Titanic to a chorus of steaming zhongzi and sizzling jianjiao. And who would have thought that the gruff behemoth of a Shanghainese dumpling chef would secretly jam to Little Apple (小苹果）in his downtime? If we had just provided a photo collage of our mid-morning trip to Zhaozhou Road, the streets may have seemed to be a little sleepy in comparison to some other popular street food destinations in Shanghai. We arrived a little after the heavy morning rush as to catch vendors when they were available to talk, and as such missed out on the 8:00 AM whirlwind of activity in the stalls and around the nearby wet market. As we learned from a particularly friendly vendor from Jiangsu province, the main reason that Zhaozhou Road became a hub for street food vendors in the area is that it was convenient for them to buy ingredients there and then immediately set up shop to feed the market’s other patrons. That being said, it seemed that for the most part the vendors themselves did not interact with each other as much as they did with the market itself. Most of the vendors we asked did not carry on relationships with the people working at the other end of the street. The one exception to this rule seemed to be between our Jiangsu friend and the vendor set up directly beside her who sold zhongzi. You may be wondering, after all of this information, about how the food was? Fear not, blog-goer! I have the answers you seek. While going about conducting our five interviews, Xiran, Tyler, and I sampled a wide variety of Chinese street cuisine. Vendors on Zhaozhou sold jianjiao, Shandong-style pancakes, zhongzi, Xinjiang-style bread (of both the sweet and salty variety), and fried scallion pancakes (in addition to raw pork and vegetables, of which we did not partake). Although our hunger may have biased our votes, our crew was pretty happy with how everything tasted… except for the zhongzi. This is personal prejudice, I recognize, but given the option of eating my own sneaker instead of consuming another zhongzi I would seriously consider how much I really need a pair of Nikes. I digress. There was something comforting about eating the Chinese equivalent of a quick breakfast—that I cannot deny. Those days stand out in my memory for many reasons, but if I were to describe theaura of Zhaozhou Road I think it feels surprisingly ordinary. This is not a street of salesmen aggressively peddling their fake Beats, nor is it a peaceful rock garden. The shiny financial district is just across the river, but it might as well be half a world away—the people here are working for a living, and that’s how it feels. There isn’t much time to reminisce about your favorite song when you have mouths to feed back home, wherever home is for you. That is Zhaozhou Road for me—a loosely-knit community trying to get by, but not doing so in an abrasive or forceful way.